Holy Mackerel! Church of the Big Fish now Open and Inviting Worshippers! 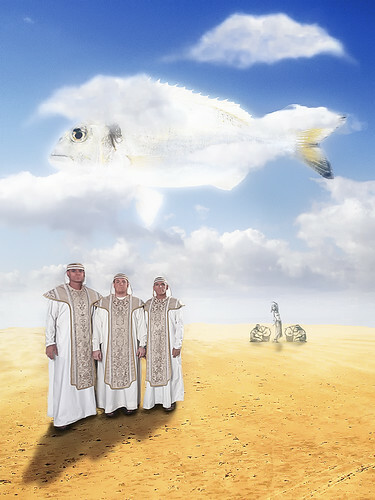 I got this great assignment recently to do some advertising shots for the high priests of the newly formed church of the big fish. Conditions were unreal. Huge light from the big fish turned the faces into darkness. I decided I needed some serious lights myself for this shot. Strobist Info: White Lightning 1600 into big 5” Octabox camera right at 1/4, White Lightning 800 into socked beautydish camera left at 1/8. Powered by 2x Elinchrom Quadra Ranger SX fired by Elinchrom Skyports. Posted by admin. Categories: Big Church. Tags: Church, Fish, Holy, Inviting, Mackerel, open, worshippers. Comments Off on Holy Mackerel! Church of the Big Fish now Open and Inviting Worshippers! Westboro Baptist Church, of Topeka, is planning a protest at Trinity High School in October. The church is known for its members protesting at the funerals of fallen service members. How do you feel about the planned protest? The bishop of the Episcopal Diocese of Upper South Carolina cleared the way Wednesday for Trinity Episcopal Cathedral to dissolve its 11-year relationship with the Very Rev. Philip C. Linder, the dean who was suspended in July.